According to documentation submitted to the city’s Planning Department, 555 Howard is slated to contain 69 dwelling units and 255 hotel rooms. 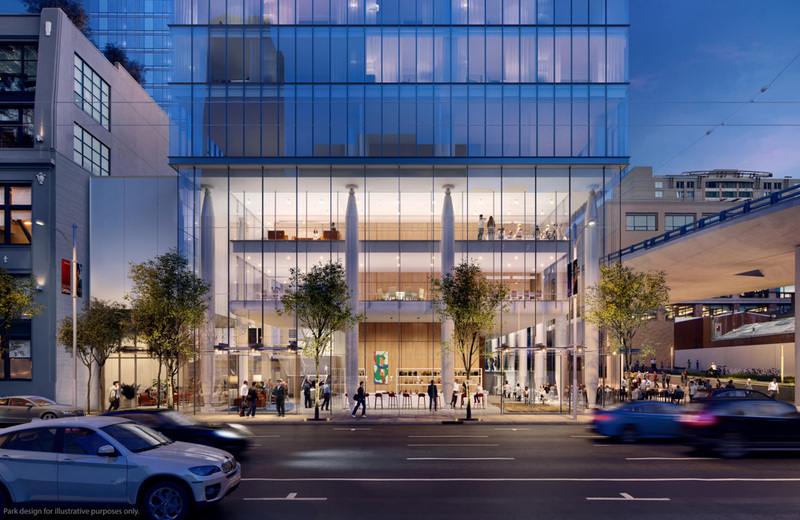 New York City–based Renzo Piano Building Workshop and developer Pacific Eagle have revealed renderings for 555 Howard, a new, mixed-use hotel project slated for San Francisco's Transbay neighborhood. The project, if completed as planned, would become the fourth tallest structure in the city. According to documentation submitted to the city’s Planning Department, the project is slated to contain 69 dwelling units and 255 hotel rooms. Of the 69 dwelling units, 15 percent would be set aside at affordable rates. The rectangular tower, clad in transparent glass and rising to an overall height of 385 feet, would be built on the site of a collection of low-slung masonry buildings dating to the early 1900s. Those structures were analyzed by the Transit Center District Historic Resource Survey in 2012 and were not found to be “Contributory or Significant Buildings” for the neighborhood. Renderings released for the project showcase a glassy, boxy tower that steps back slightly roughly halfway up its height. According to the report, the residential portion of the building would be located between the 20th and 36th levels, with the hotel program sitting below. The 21st floor, where the building steps back, will include an outdoor terrace meant for use by building residents. The structure also features a triple-height ground floor lobby area with what looks like retail uses. The lobby is lifted on slender, pencil-tipped columns similar to those the architect used in the firm’s Modern Wing addition to the Art Institute of Chicago building. The lobby also features a pair of intervening mezzanine levels. The project proposes creating an “under ramp” park spanning one full side of the structure, underneath an adjacent elevated highway onramp. The building’s massing is split at roughly the centerline along that expanse, creating a wide reveal in the facade that, according to the planning documents, is meant to minimize the massing of the structure. Turns out the vociferous opponents to a Beale Street station in San Francisco had it right. The California High Speed Rail Authority voted last week not to build an underground station at Beale Street to serve as the northern endpoint of the state's future high-speed rail line. 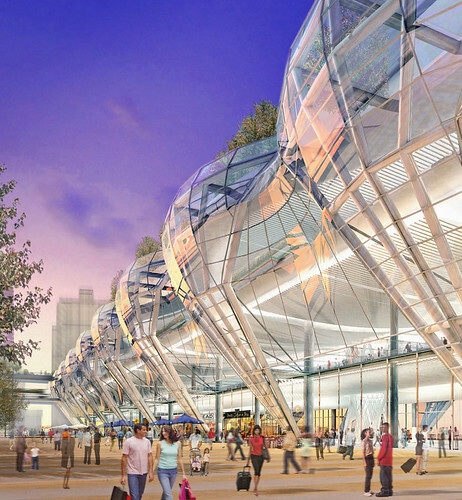 Instead, the bullet train will make its final stop in the Transbay Terminal that is already slated to be built in downtown San Francisco. The Beale Street station plan had met with months of protest by San Franciscans, including a strongly worded petition from South Beach residents last year. Among their complaints: The Beale Street option would have required the demolition of several residential high-rises; its construction would have endangered the base of the San Francisco-Oakland Bay Bridge; it would have cost over $1 billion to acquire the right-of-way; it was being pushed for political reasons by unidentified special interests; and it flouted the wishes of San Franciscans, who voted in 2008 for Proposition 1A, which specified the Transbay Terminal as the endpoint of the high-speed line. The California High Speed Rail Authority was convinced, voting 6-1 last Thursday in favor of Transbay over Beale. The $4 billion Transbay terminal is being designed by Pelli Clarke Pelli Architects, who published some dramatic renderings in 2007 showing a rooftop park, retail street, and attached skyscraper. A gamble in 2009 paid off when the team revised their plans and won a $170 million loan through the Transportation Infrastructure Finance and Innovation Act, speeding up California's high-speed dreams.